Here at Portola Dental Group, we are proud to offer crowns to our patients. In cases where a filling or onlay is not enough to repair the damage to a tooth as a result of trauma or decay, a crown (or cap) is a cosmetic dental procedure that encases the entire tooth, completely restoring it to the original size and shape. A crown will provide strength and stability when chewing. 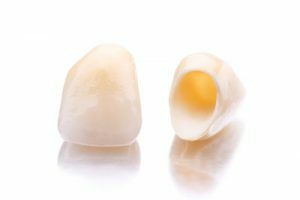 There are several types of crowns, but the most popular by far is a porcelain crown due to the fact that they are the same color as your natural teeth. They are very tough and durable and will last many years, but like all tooth surfaces that endure chewing and grinding they will eventually have to be replaced. A tooth with a root canal. What happens when you get a crown? Getting a crown is much the same procedure as getting an onlay. The procedure will generally take two visits to the dentist. The first visit will involve taking very accurate impressions or molds of your teeth. It is from these impressions that your new crown will be constructed in a dental lab. The dentist will numb your tooth and remove any decay as well as older fillings, then place a temporary filling over the area. In the second visit, the temporary filling is removed and the tooth is re-cleaned. The new crown is then cemented into place and final adjustments for bite are made, along with polishing. With proper care and maintenance, your new crown will last many years and provide a happy and healthy smile. Cosmetic dental procedures from Portola Dental Group are a great way to improve your smile and make chewing and eating easier. One of our most popular cosmetic procedures is a “dental bridge” which is the application of a fixes (non-removable) dental appliance which replaces broken or missing teeth. There are several different types of dental bridges, and the correct one for your case will be determined by your dentist and yourself discussing the options that are best for your case. A “traditional bridge” is the most popular type of dental bridge, and is made of porcelain false teeth adhered to metal. The teeth will closely resemble the rest of your existing teeth, and the appliance itself is a bridge that typically consists of two crowns that go over the “anchoring teeth” or abutment teeth. These are attached to artificial teeth which fill the gaps between the anchoring teeth. Dental bridges typically last many years, but may need to be replaced for wear. Fill in spaces where teeth are missing. Prevent drifting of existing teeth. What happens when you get a dental bridge? A dental bridge is typically a two visit procedure where a portion of the enamel is removed after numbing the teeth, in order to prepare them for the crowns. A mold or impression is taken and dental to the dental lab for creation, and during the next few weeks a temporary bridge will be worn. During the second visit, the new bridge will be adhered and checked for fit, and adjusted if necessary. There are cases where the cementing will be semi-permanent for a few weeks while you get used to the new bridge, at which point it will be permanently affixed. You will then receive care instructions in order to properly maintain the life of your new bridge. Regular brushing, flossing and checkups will extend the lifespan of dental bridges. A dental bridge is a way to replace a missing tooth. At Portola Dental Group, we provide clients with dental bridges if they want to replace a tooth without wearing dentures or undergoing surgery. The new tooth is held in place by two crowns. It looks natural and consists of a ceramic or porcelain material to match the surrounding teeth. 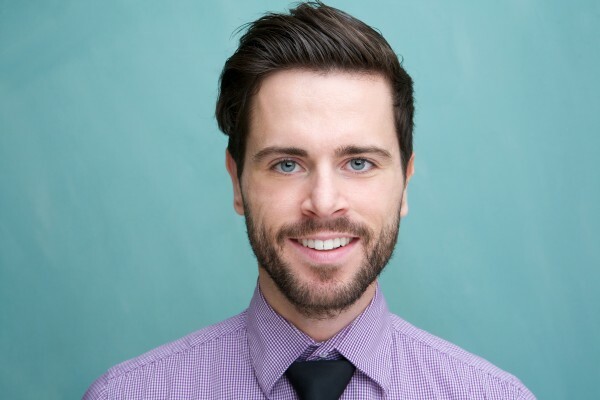 As a cosmetic dentist, Marc E. LeBlanc, DDS will make sure that the new tooth looks and feels amazing. If you are getting dental crowns or a dental bridge for cosmetic reasons, we recommend that you whiten your teeth first. At Portola Dental Group, we offer teeth whitening procedures that can improve the appearance of your smile quickly and easily. It is important to have this procedure done first because the material that crowns and bridges are made out of are both stain and bleach resistant. That means that if it is created to match yellow teeth, it will remain yellow even if you have your teeth whitened at a later date. When you have the procedure done first, your new crown or bridge will be made to match your new brilliantly white teeth. When getting dental crowns and dental bridges installed, it is advisable that you work with a cosmetic dentist that knows how to complete the procedure in a way that looks natural. At Portola Dental Group, we can do so while also working to keep our patients as comfortable as possible by using sedation dentistry. The process for both procedures is fairly similar. Before getting started, an impression is taken of the teeth so that the new crown or bridge can be created in a dental lab. When placing a dental crown around a tooth, Portola Dental Group starts by preparing the tooth. We will need to remove a portion of the enamel so that there is room for the new crown to surround the tooth without pushing other teeth out of place. Once complete, we will clean the tooth and secure a temporary crown to it using removable glue. Patients typically wear a temporary crown for around two weeks while waiting for a permanent one to be created in the lab. During this time, it is important to be careful with what you eat and how you brush your teeth since the temporary is designed to come off. The benefit of wearing a crown is that it surrounds and protects the tooth. This means that regardless of how damaged the tooth was, you can eat your favorite foods without fear of discomfort. A crown can restore the functionality of your mouth by making it easy to eat, drink and speak like normal. This is ideal for people that are suffering from severely sensitive teeth, have a cracked or chipped tooth or have undergone a root canal. Similarly, a bridge makes it possible to eat and speak like normal without worrying about your new tooth becoming loose or falling out. They are both ideal for people that have active lifestyles and don’t want to be constrained by their teeth. To find out if the procedure is right for you, call 760-201-4085 to schedule an appointment with us and discuss your options. At Portola Dental Group, we make it easier for patients throughout Palm Desert to have a beautiful and functional smile.